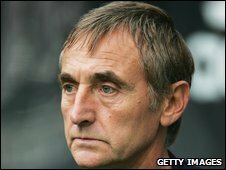 Blackpool caretaker manager Tony Parkes has left the Championship club after a meeting with chairman Karl Oyston. The 60-year-old former serial Blackburn caretaker took over at the Seasiders in December and helped to steer them away from the relegation zone. "He wanted to spend more time with his family and have a break from football," Oyston told the club website. The Tangerines are now interviewing for a new boss, with coach Steve Thompson believed to be a strong candidate. Parkes and Thompson took over at Bloomfield Road at the end of last year following Simon Grayson's departure to Leeds and guided them to safety with an impressive string of results. Oyston added: "Tony's now decided to leave Blackpool. We had a discussion last week about things in general and where the club needs to head. "Tony certainly supports the changes that need to be made to improve a number of areas. "Obviously it's no secret that Tony's had family issues to deal with and a day after the discussion he met with the club secretary and tended his resignation. "It's fair to say Tony's done a fantastic job, particularly since Simon Grayson left in difficult circumstances." Former Seasiders midfielder Gary Brabin, now Cambridge boss, Bury's Alan Knill, former Oldham manager Andy Ritchie and ex-Leicester boss Ian Holloway have also been linked to the job.